Hidden in an industrial part of Sand Island, along the shores of Keehi Lagoon, La Mariana Sailing Club is notoriously hard to find. A Mai Tai should never be consumed in a hurry. That’s a general rule of thumb. But nowhere is that more true than when you’re at La Mariana Tiki Bar and Restaurant in Honolulu. It’s near impossible to be in a hurry at this 57-year-old watering hole, tucked away in an industrial part of Sand Island, along the shores of Keehi Lagoon. It’s the kind of place where time seems to warp. You’re already operating on island time, and as soon as you walk in the door, you’ll wonder if you walked through a time machine, too. It’s the last of Honolulu’s original tiki bars, and it’s something of a museum to Hawaii’s history and the tiki bars of old. Artifacts and memorabilia from Hawaii’s shuttered tiki-themed restaurants, including old carved tikis from the Sheraton’s Kon Tiki Room, line the walls. The decor is straight from the ‘50s. Take a seat in a well-worn rattan chair (from Don the Beachcomber’s), under fishing nets, sea glass balls, pufferfish lamps (from Trader Vic’s), and Christmas lights, all surrounded by tropical plants and an indoor waterfall. Watch the boats bobbing in the marina. Enjoy the nightly live piano entertainment. 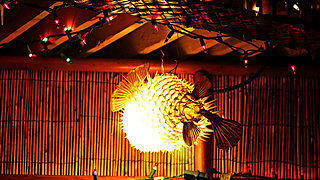 La Mariana features plenty of traditional tiki bar decorations, such as pufferfish lamps. That La Mariana has survived all these years is thanks in no small part to Annette La Mariana Nahinu, who established the sailing club in 1957 after she and her then-husband sailed the Pacific as newlyweds and ended up in Hawaii. Once settled into their new home, they entertained dreams of opening an affordable sailing club. 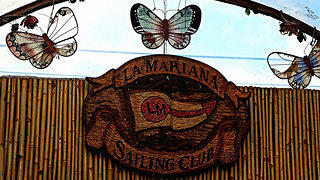 Work began in 1955; La Mariana Sailing Club opened two years later. And throughout the years, Annette worked tirelessly to collect the tiki memorabilia that gives La Mariana its timeless charm. Its survival is not without struggle. A tsunami ravaged the site in 1960. And in 1975, Annette was given just a few short days to vacate the land. She found a new location just 50 feet upshore, at the site of a former junkyard. She created a replica of her restaurant, where it has stood ever since. 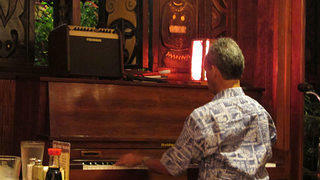 La Mariana's undeniably Polynesian ambiance is complemented by a piano. In 2008, La Mariana, and indeed the entire community, mourned Annette’s death at the age of 93. In keeping with their promise to her, the staff carried on the La Mariana tradition. Go today, and you’ll see that little has changed over the years—something the many longtime customers appreciate so much. Hours: Open daily. Lunch: 11 a.m. to 3 p.m. Pupus and drinks: 3 p.m. to 5 p.m. Dinner: 5 p.m. to 9 p.m.
You’ll Have: La Mariana is famous for its Mai Tais and Zombies. Try both.